The ship "Discovery" was built especially for Scott's expedition in 1901 to make an attempt on the South Pole, a wooden sailing ship with auxiliary engines. Barque / 3 masts / / L,B,D 172' x 34' x 15.8' - 52.1m x 10.3m x 4.8m / 485 tons / Hull: wooden / Compliment: 39-43 / Engine: 450 nhp, triple expansion, 1 screw, 8 knots / Built: Stevens Yard, Dundee Shipbuilders Co. Dundee, Scotland, 1901. "There's wind in the sky" the Discovery held up in congested pack ice off MacRobertson Land Antarctica. The sky is over clouded by the characteristic "Cirrus Radiant" which precedes a blizzard. The Discovery frozen into offshore ice during the winter, Antarctica. Scott takes to the air at Barrier Inlet in a tethered hydrogen balloon. The still iced in Discovery with the Morning and Terra Nova sent to rescue her and her crew, it took seven weeks to break through 18 miles of ice to reach her. From the left: Edward Adrian Wilson, Ernest Henry Shackleton, Albert Armitage, Michael Barne, Dr. Reginald Koettlitz, Reginald Skelton, Robert Falcon Scott, Charles Royds, Louis Bernacchi, Hartley Travers Ferrar, Thomas V. Hodgson. Purchased by the Hudson's Bay Company in 1905 and converted for use as a merchant. Laid up from 1912 - 1915 during WWI. From 1915 - 1920 traded under charter in European waters from Archangel in Arctic Russia to the Black Sea. She was loaned in 1916 to the British Government to rescue Shackleton's party marooned on Elephant Island, but they were rescued before she arrived. Purchased in 1923 by the Crown Agents for the Colonies for scientific research. From 1925-1927 cruised between Cape Town, Antarctica and the Drake Passage conducting research on whaling grounds and oceanography. In 1929 she was employed by BANZARE, the British, Australian and New Zealand Antarctic Research Expedition with Sir Douglas Mawson. Laid up from 1931-1936 when acquired by the Boy Scouts Association for use as a stationary training ship and hostel in London, used by the admiralty through WWII for the same purposes, engines were scrapped. Used by Sea Scouts and Royal Naval Reserve from 1946-1979. 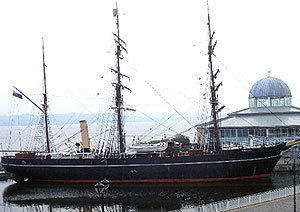 Transferred to the Maritime Trust and restored to 1925 appearance, currently on open public display as a museum in Dundee since 1986. Photo use - Allport Library and Museum of Fine Arts State Library of Tasmania. The Discovery was itself modeled on the design of a whale ship also called Discovery (ex Bloodhound) that had been on an Arctic expedition in the 1870's. The great arctic explorer Nansen had recommended that the ship be a duplicated design of the Fram. The Ship Committee of the expedition however decided that a conventional whaling hull would be more appropriate as the ship would have to cross the ominous Southern Seas to get to Antarctica. A summary of her design by Admiral McClintock, Chairman of the Ship Committee, on 29 November 1899. Finding a yard to build the Discovery was not easy as wooden hulls of that size had become rarities by 1900 when the building of the ship was put out to tender. She was almost built in Norway but it was decided that a ship for a British expedition should be built in Britain. The ship had a massively built wooden hull that was designed to withstand being frozen into the ice. The propeller and rudder could be hoisted out of the way to prevent ice damage. Iron shod bows were severely raked so that when ramming the ice they would ride up over the margin and crush the ice with deadweight. She was also at the time the first ship ever built in Britain specifically for a scientific expedition and cost £50,000 of the total budget of £92,000 for the expedition. She left the Dundee shipyard where she was built on July 31st 1901 sailing south to Antarctica. Undoubtedly strong, the Discovery was flawed in many ways during her building. Once she reached New Zealand she was put into dry dock (there was no time for in Britain before her departure). The ship's carpenter signed a damning report with such details as numerous empty bolt holes and improperly clenched bolts being uncovered. Six feet of seawater had seeped into the hold since leaving Britain. Many harsh exchanges ensued between the Dundee shipyard and the Royal Geographical Society headquarters in London - the organizers of the expedition. Like other ships designed for ice, before and since, the Discovery rolled terribly at sea. The flat shallow hull with no protuberances that works so well in ice provides minimal stability in normal and particularly in heavy seas. Scott was unimpressed with the ship initially in the English Channel pronouncing her sluggish, short-masted and under-canvassed. By the time she had reached the roaring forties, these same characteristics had become virtues. She could sail through the worst gales with a considerable amount of canvas aloft in winds that would have stripped the sails from more conventional ships. Amongst the crew on this expedition was Ernest Shackleton engaged as third lieutenant in charge of holds, stores, provisions and deep sea water analysis. On reaching Antarctica and after some initial explorations along the coast, the Discovery made its way to McMurdo sound where winter quarters were to be established. She was frozen in for the winter in the protected waters of the sound in 1902 and remained there over the next nearly two years until February 1904. A supply ship the Morning, came to bring supplies in the meantime. As well as an extensive scientific programme, one aim of the expedition was to attempt to reach the South Pole. A party of Scott, Shackleton and Wilson reached 82Â°17'S on December 31st 1902 at which point, they turned back due to the effects of scurvy and a lack of food. They had however traveled 300 miles farther south than anyone before them and were only 480 statute miles from the Pole. It took them just over another month before they reached their base, as Scott put it "We are as near spent as three persons can be". They had been gone for ninety-three days and had covered 960 statute miles. The "Morning" returned in 1904 this time accompanied by another ship the "Terra Nova". The government in England had decided that the Antarctic party might be having too good a time of it! - relieved once a year by a hugely expensive relief ship - and wanted them all brought back whether or not the Discovery had to be abandoned in the process (the Morning had reported the previous year that the Discovery was still frozen in and could only be removed with great difficulty). For a while it looked like the Discovery might well be abandoned as there was 20 miles of ice between it and open water. With much hard work, explosives, the wind eventually in the right direction and finally the two relief ships breaking their way through the remaining ice - the Discovery was released and all three ships were under way heading back north. The Discovery arrived in Portsmouth on September the 10th 1904. Scott had wanted to use the Discovery again for his second expedition leaving Britain in 1910, but the admiralty had sold it to the Hudson's Bay Company some years before, and they refused to sell her back. After considering several other ships, Scott purchased the Terra Nova, which had been used for whaling and sealing since her return from the Discovery expedition. This does not include the amount of coal that will be required for warming, dredging and sounding purposes. It is possible however, that some 20 or 30 tons of coal can be stowed elsewhere in the ship, either on the upper deck, or in unoccupied spaces below. The full power speed of the ship will be about 8 knots, somewhat in excess of the speed of [the old] Discovery. In order to fall in with magnetic requirements, the engine and boilers will be situated aft. The horse power will be 450, and the ship will stow, in bunkers, 240 tons of coal. She will be fitted with masts and sails, and barque rigged, so that fuel can be economised while making a voyage, and advantage can be taken of favourable winds, even when navigating in the pack. The Magnetic Observatory, 8 feet by 6 ft. 6 in. will be on the bridge before the mainmast, and no iron work will be permitted within 30 feet of it. [It was in fact fitted on the upper deck.] For biological work there will be two houses, properly fitted on deck, and a laboratory 10 ft. by 7 ft. forward on the lower deck. There will be an auxiliary engine, and special arrangements for sounding to a depth of 4,000 fathoms, and also for dredging up operations. All other details have been carefully designed for ice navigation, for promoting warmth and dryness below, and for facilitating scientific investigations. The cabin accommodation includes a sitting and sleeping cabin for the captain, one for the navigator with places in it for the chronometers and with facilities for drawings &c. The other cabins for the other executive officers, and one for the engineer, and three for scientific civilians, of whom one, or more, ought to be surgeons, one to be in medical charge of the ship. Extra cabin space can be found for two or more scientific civilians, but only by encroaching on the space now set apart for the health and comfort of the crew. The Ship Sub-Committee are much indebted to Mr. W. E. Smith for the skill and ability he has devoted to the design and details of the ship, and also to Mr. Marrack for his work connected with the engines and boilers, and the protection of the propeller. They congratulate themselves on the fact that the plans and designs approved are those of a vessel which will be, by far, the best adapted for severe weather and ice navigation, as well as for scientific investigations, that has ever entered the polar regions. They are of opinion that the total complement of this vessel should not exceed 48 to 50 souls.